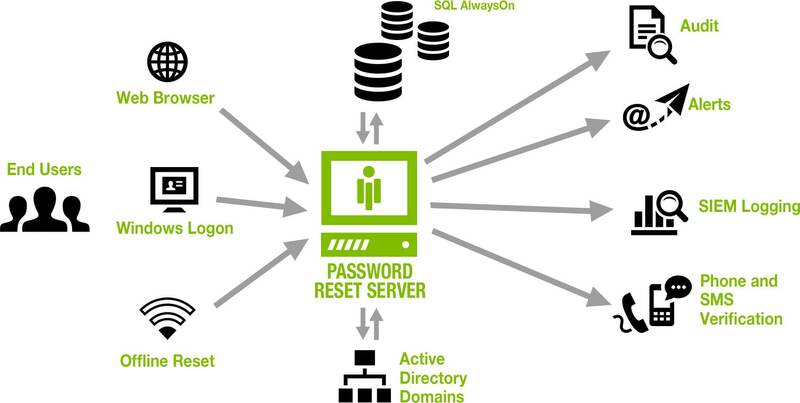 Why do IT Admins and IT Security Pros love using our self-service Password Reset tool? amount each help desk call can cost. Password management tools can reduce password-related call volumes by an average of 70%. We enable end-users to securely reset their Active Directory and Office 365 passwords from a self-service web portal or integrated Windows Logon screen. IT admins and security teams can enforce custom end-user password security policies, permit users to update their AD attributes such as address and phone numbers, and securely reset their Active Directory and Office 365 passwords through the self-service portal. Password Reset Server enforces stronger and more secure end-user password controls. Plus, our password reset software meets Section 508 compliance standards. Password Reset Server frees up your IT help desk staff from time-consuming and inefficient processes, and gets employees back to work. Implementing a self-service tool for end-user password resetting only improves your organization’s efficiency if it’s well adopted by users—and all our tools are! Our reliable, USA-based support sets us apart from every other self-service password reset tool, but doesn’t cost you more. Password Reset Server can verify user authenticity with phone verification by calling or sending an SMS to the phone number registered to the user’s account and providing a pin code. Customization security questions can also be configured, and identification questions can even include image recognition questions. Our Windows Logon screen means end-users initiate the password reset process from their workstation. Advanced security features confirm the user’s identity. Offline Reset allows remote users to perform password resets through a secure portal, even when their computers are offline. Enable end-users to make changes to their AD attributes, like home address and phone number. Administrators can choose which attributes can be viewed and modified by enrolled users. Users can also validate that their information is correct, so invalid information can be captured through reports. Trust-based security policies customize password reset procedures based on your Active Directory OU structure. All activities, including password resets and changes to security policies, are audited for added security and documentation for compliance requirements. Administrators can automatically enroll employees or allow them to manually enroll and set their own security questions. Manual enrollment includes automatic email reminders to encourage and track enrollment by sending emails from within the application. Password Reset Server is a tool that’s accessible to your employees with disabilities, and is compliant with Section 508 requirements. Minimizing Help Desk calls can save significant amounts of time and money. 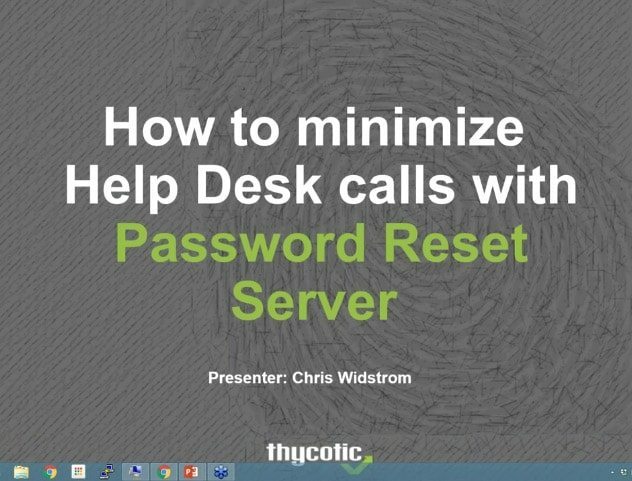 Learn how Thycotic’s self-service password reset tool for end-users can simplify your password management. By allowing employees to reset their forgotten Active Directory passwords directly from the web or Windows login screen, Password Reset Server can drastically cut Help Desk calls and reduce costs. putting you at risk every day? Discover weak passwords in minutes. Get an Executive Report to identify risks.